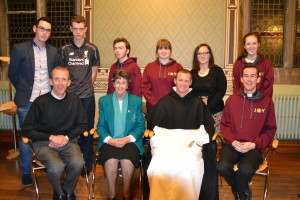 At the recent ‘Great People, Great Stories, Come and Listen’ event in the Synod Hall, Armagh, the guest speakers were Brother Philip Mulryne, former Manchester United and Norwich City footballer, currently in formation for the priesthood with the Dominican Order; and Sister Rhoda Curran, Sister of Mercy, Director of the Armagh Diocesan Pastoral Centre, Dundalk, well known also for her involvement with the Beginning Experience and Rainbows. Uplifting music and song was provided by Paschal McAnenly with proceedings chaired by Sr Carmel Flynn. Brother Philip’s testimony was truly inspiring as he took his audience through his childhood days in Belfast, his experiences as a professional footballer to his current life. Philip attributes his arrival at his true vocation to the prayers of his older sister, who knowing that priesthood was his destination, prayed for 15 years that he would finally recognise his call. In recalling his childhood days in Belfast in the 80s, he said: ‘I had a natural relationship with God, God was very real to me, but I did not consider myself to be overly religious.’ In moving to Manchester at 16 he felt that he was fulfilling his sole objective and passion in life to play football professionally. He realised that he did not take a ‘living faith’ with him and was, therefore, easily subsumed into the alluring lifestyle. Yet he also appreciates that here a definite thread to his present life was established in the discipline of training, and in the values gained from the influence of people such as Alex Ferguson, Roy Keane etc. ; particularly highlighting humility. His move to Norwich in 1999 witnessed a further thread in the person of Delia Smith whose strong faith he found admirable. He recognised that at this time he continued to live and love the glamorous lifestyle as: ‘that was where I was at this time. I had lots of money, didn’t know what to do with it so was constantly searching. Life was an endless search through things.’ However, a defining moment came for him when he invited his older sister and her family to share Christmas with him in his recently acquired mansion. His pride ‘took a knock’ when she was totally unimpressed and simply asked: ‘Are you happy, Philip? This question haunted him and led him to reflect on the meaning of life resulting in him returning to his ‘physical’ home in Belfast and his ‘spiritual’ home the Church through his involvement in the Legion of Mary and in his work in a homeless shelter. Here the ‘powerful image of grown men on their knees praying the Rosary’ resulted in him realising the presence of God in all men….. ‘turning everything upside down for me’. Priesthood not football now became his passion and the realisation that if he did not answer this call he would spend the rest of his life regretting it. He concluded by stating that the decision has brought him ‘tremendous joy’ and the wonderful consolation that in times of darkness, which do happen for us all, ‘God is there for me’. Certainly an awe-inspiring story! Sr Rhoda began by stating that ‘Yes, I am a Sister of Mercy, but I am more than this. Once I was a girl with dreams, an older sister, (in a family of 11) a daughter …….’ In recalling memories of her early years where her vocation was established she recalled beautiful memories of her mother singing the children to sleep to ‘The Bells of the Angelus’ and the simplicity of a non-technological lifestyle in which following her faith in church attendance, family prayer, the St. Gerard Majella Novena, Mission attendance, the example of her parents, were influential factors. However, her teenage years presented her with the dichotomy of living the expected life, and the struggle within to face and answer God’s call to her. She now acknowledges that not sharing this was a mistake, and with hindsight would do it differently, which probably would have meant avoidance of several setbacks encountered. Eventually in 1960 she entered the Sisters of Mercy in Dundalk and in 1964 fulfilled her dream to serve on the Missions in Alabama, a segregated state, where she was involved in educating the people for life. The call home to Ireland years later was difficult for her but she has come to terms with this and leads a fulfilling life in her present roles. Sr Rhoda went on to outline the wonderful ongoing work of her order throughout the world, especially in terms of the prevention of human trafficking and child prostitution, encouraging the audience to support the work of MECPATH. Sr Rhoda, in an aside, encouraged all to have a memory/blessings cup or box. She concluded by highlighting the life and work of the founder of her order Catherine McCauley, relating this to the forthcoming Year of Mercy, giving everyone food for thought as to how they can respond to this. The evening concluded with a lively question time, followed by prayer, then refreshments, allowing more time for those present to discuss the issues raised. The Diocesan Vocations Commission has once again challenged people to respond to the Baptismal call to everyone to follow God’s personal call to them.